Everyone agrees that when it comes to having an online store, images are not optional, they are essential. Before making a purchase, customers want to see alternate views of the item they are considering. While this is a great convenience for your customers, it can sometimes be a headache for you! Ensuring that images for all products offered in your store have the same size, look and feel is not easy. You may also have products with multiple colors and views, and very soon this is a time-consuming project for you or your co-workers. xocbox tools can make adding images and swatches a simple task, and by integrating with the latest technology from Dropbox, your image editing process can even be managed remotely, or outsourced. By using xocbox image editing tools in the xocbox application, you can crop, edit, and create swatches without having to leave the application, then push them right into your store. 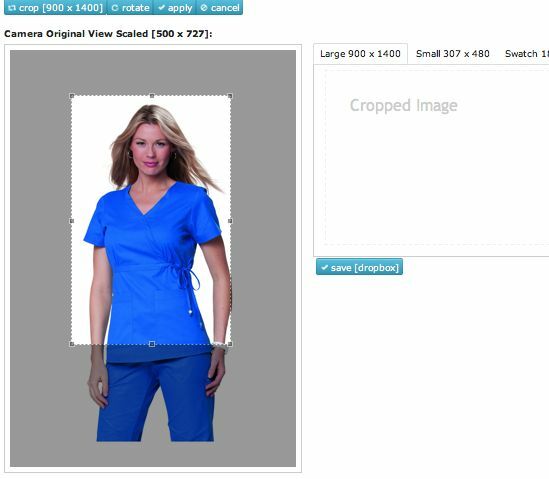 By using xocbox image editing tools right from the xocbox application, you can crop, edit, and create swatches without having to leave the application, then push them right into your store. Creating perfectly sized, professional swatches is an easy job with the xocbox swatch tool. Have fun editing your images! With our "no touch stores" images are added and sized via automated process to fit your store design.